Use the drop-down lists and arrow icons located at the top and bottom of each page. We turn now to some tasks for which Sage is very well suited. This page is meant to show what Sage can do, but it also describes the solution to a practical problem — determining the volume of liquid contained in an odd-shaped but common storage tank, for different sensor measurement heights. The page following this one addresses tanks with a circular cross-section. That class of tank has a somewhat more complex volume computation, so I thought I would first describe a kind of flat-sided tank with a comparatively simple solution. In reading this article it will benefit the reader to have access to a Sage notebook interface, either locally or online. To get your free copy of Sage, click here. Refer to Figure 1 on this page. A tank like this might have sides all parallel/orthogonal (a cube), in which case the total volume is equal to x * y * z, and a partial volume equal to x * ysensor * z, with ysensor referring to the liquid sensor height in the tank. Unfortunately, there are few real-world tanks with parallel sides. 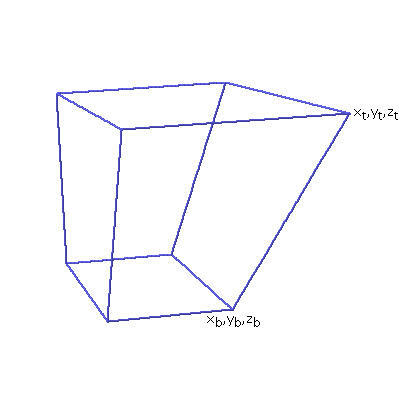 Where xb and xt are the tank widths at the bottom and top of the non-parallel dimension, and y and z are the sizes of the two parallel dimensions. We turn now to the first non-trivial computation. For the above first-order trapezoidal tank, we need a way to compute the volume of the tank's liquid contents for any arbitrary sensor height in the y (vertical) dimension. We know the width of the tank at the bottom and the top, but to compute partial volumes we need to find intermediate tank widths for any sensor height, and then apply a version of equation (1) above. To be more specific, we need to way to interpolate between xb and xt as a function of the y dimension sensor height. 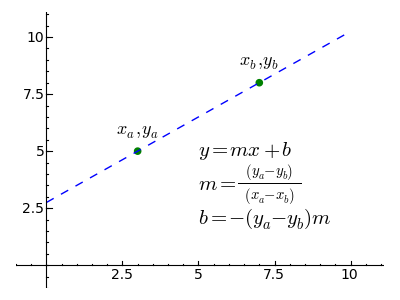 The classic procedure for acquiring a linear regression is shown in Figure 2. This method was common at a time when computations were performed by hand, using pen and paper and possibly a slide rule or an abacus. Because of these constraints, the procedure was broken down into as many steps as possible to guard against error. Now that computers are ubiquitous, a more flexible, one-step regression equation is becoming popular. 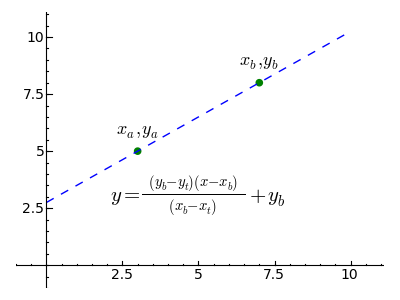 Shown in Figure 3, it is normally embodied in a function for convenience and so that its users are not burdened by its inner workings (a computer science idea known as "encapsulation"). Remember when copying and pasting these complex cell contents: resist the temptation to "fix" the indentation of certain lines. The indented lines must remain as shown for the content to work as intended. The reader can see from this example that the custom function "render(x)" produces a nice graphic rendering of its argument, suitable for exporting into a Web page like this one. Readers who want to use this function need to understand that the graphic image displayed in the Sage worksheet won't be automatically saved anywhere useful — the user must right-click the image, click "Save Image As..." and specify a path. Some readers may wonder why I have written ntrp(x,xb,xa,yb,ya) as a pure mathematical function rather than a Python function (as I did for the function "render(x)" earlier). The answer is that if one intends to use the function in algebraic manipulations, the pure mathematical function form is needed, but if processing speed is the only issue, a Python function is preferred. As it turns out, this function will be used as a component in a number of increasingly complex equations later on, and its ability to encapsulate the idea of interpolation while hiding its gory details greatly simplifies the expressions in which it is used. print "<html><u>  &deg;c   &deg;f </u></html>"
Notice that, instead of trying to rewrite the interpolation function to apply it to this case, I simply entered variable names appropriate to this example and let Sage sort it out. (The variable subscripts refer to their position on the tank: xb = bottom, xt = top.) Because the size of this tank's z dimension is a constant, to get an area I simply multiply the interpolation result by z. In order to keep this article from becoming overly large, I'm going to move ahead to the more generally useful second-order trapezoidal solution, which can be made to compute this tank type also (by setting zb and zt to the same value). Scroll horizontally to see the full result. This time we'll be testing our function before putting it into service in a field where, because of what these storage tanks might contain, there is no such thing as a trivial wrong result. xb, xt = x dimension bottom and top widths. zb, zt = z dimension bottom and top widths. yb, yt = y dimension heights corresponding to the x and z widths. y = sensor height within tank. v = tank partial volume for sensor height y. We know this is right — if divided in half diagonally, the tank would have a volume of 103/2 = 500, and by specifying xb = 5 and xt = 10 this example removes half that volume, so a result of 750 is correct. This entry describes an object with zero width at the top in both the x and z dimensions, a bottom width of 10 units for x and z, and a y height of 10 units, e.g. a pyramid. The result is correct. Computer scientists are familiar with the idea of solving subproblems, encapsulating the solutions, then moving to higher levels of abstraction using the prior solutions as components. It happens this is an effective tactic in applied mathematics as well, but until now mathematicians haven't had a practical way to encapsulate and reuse (except in an abstract sense with few tangible manifestations). Programs like Sage offer an opportunity to practice mathematics in a very productive way, building solutions piecemeal by writing and testing comparatively simple elements, then solving larger problems by assembling such elements in combination. In this example problem we created a relatively simple interpolation function, tested it, then applied it to the solution of a more complex problem. Sage allowed us to use our function in expressions that were easy to understand, then presented its results in classic equation form. This page also serves as a resource for people in the storage tank business, it isn't just a Sage tutorial. It's my hope that it will motivate storage tank operators to adopt Sage or another similar computer algebra system to solve their tank calculation problems. Those having experience with Sage will notice I haven't applied "simplify()" or "simplify_full()" to my equations on this page. I haven't because at the time of writing (Sage version 4.1.2) "simplify()" and related functions aren't particularly effective and sometimes perversely make an equation larger, an issue to which I shall return. I created the custom equation rendering function "render()" out of necessity — there are few effective ways to take an equation from a computer algebra system and place it in a Web page. There's MathML, an ambitious project meant to allow math rendering in Web pages. Unfortunately this project is almost as complex and ineffective as it is ambitious. There's TeX, which has a loyal following in academia, but it isn't a particularly efficient way to put an equation in a Web page (my function "render()" ultimately relies on TeX to get its results). I had originally intended to put a cross-reference table here, showing those CAS programs that were willing to accept plain-text versions of equations created by the others. But I quickly discovered there is essentially no present way to transfer an equation from one environment to another — Mathematica, Sage, Maxima, Maple, TeX, the OpenOffice Math equation editor and the Microsoft Word equation editor all use mutually incompatible equation syntax. At one time it was hoped that TeX would become the lingua franca for mathematical equation rendering, unfortunately TeX lives in a world of its own and rarely condescends to visit this one (a truly baroque procedure is required to turn TeX syntax into a graphic). Portable math equation rendering is an unsolved problem at the time of writing. The drawbacks to a set of graphic images of equations (as in this article) become obvious when one scales the page up for easier reading. And the size of the graphic equations rarely matches the surrounding text. MathML might eventually be adopted, but only after the committee responsible for it stops releasing new versions that summarily invalidate the old. My impression of MathML was recently confirmed when I tried to use its methods in a page I was designing. I couldn't get the simplest example to work, even when I copied a self-contained example from one page to another. I finally realized the only difference between the pages was the file extension — "xhtml" in the original and "html" for my experimental file (identifying the page's content as XHTML within the page had no effect). I realized to adopt MathML I would have to rename all 625 of my HTML pages and invalidate tens of thousands of worldwide links that refer to my pages, all in order to render equations more efficiently.